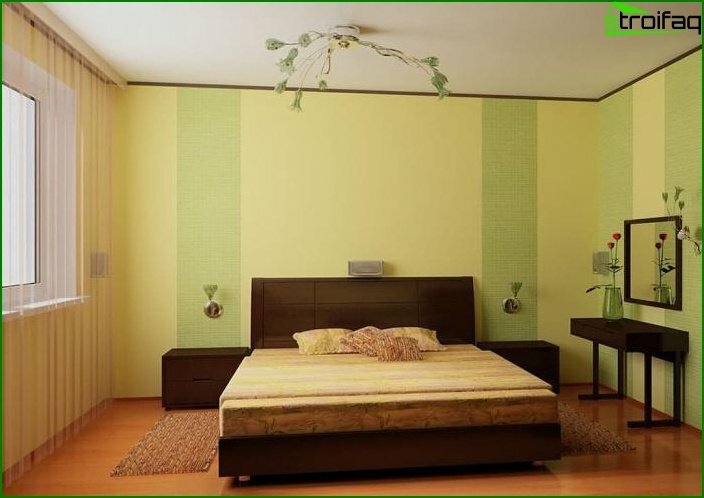 The most popular material for decoration of walls is wallpaper. 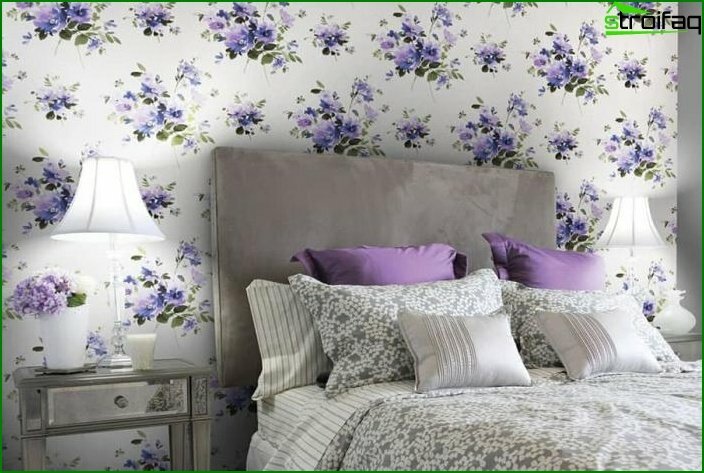 Want to know absolutely ALL the secrets of choosing wallpaper for your bedroom? 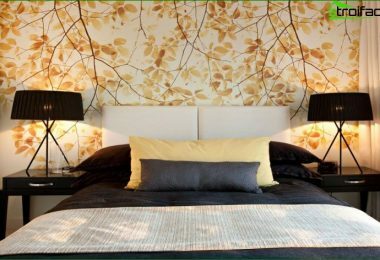 The subtleties of the use of monophonic andCombined wallpapers, 103 top modern ideas for decorating bedrooms with photo and 3D wallpapers, a full guide for different types of wallpaper - read about all this in detail in our article. 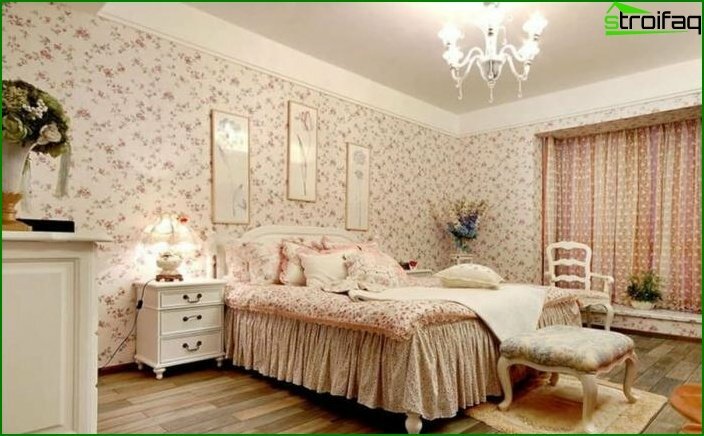 How many kinds of wallpaper can be combined in the bedroom? More precisely, as much as you need to feel complete relaxation and inner harmony. 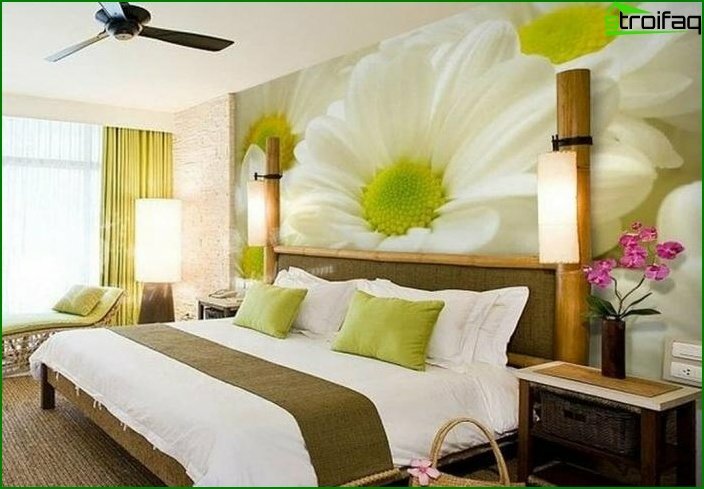 The most obvious way to use one type of wallpaper in the bedroom is to completely cover all the walls with them. 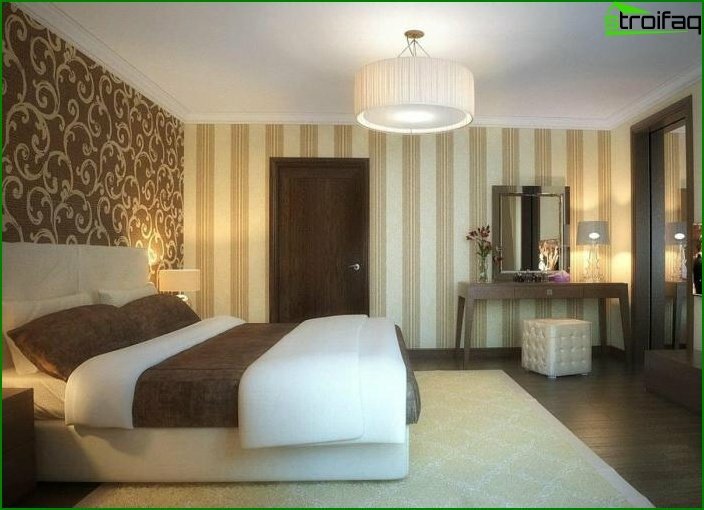 In the room there is a catchy decor and the wallpaper only emphasizes and shades out the rest of the interior details. 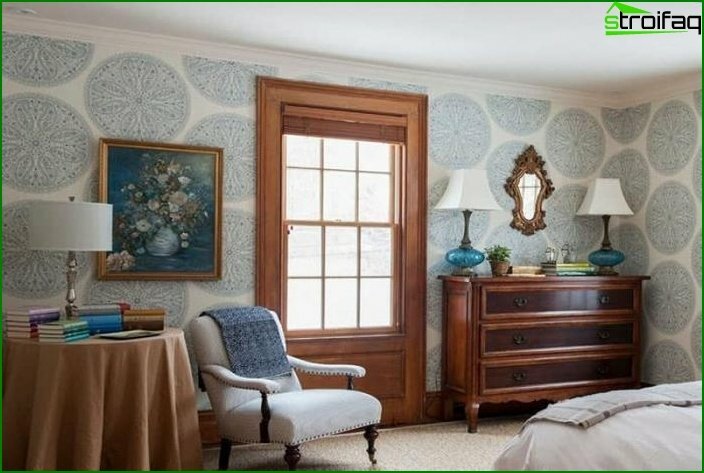 For this, one-tone wallpaper or wallpaper with a fine pattern is perfect. 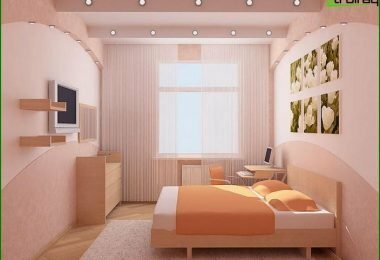 There are not enough interesting items in the room orThere is not enough room for their placement, and the walls become the main decoration of the bedroom. 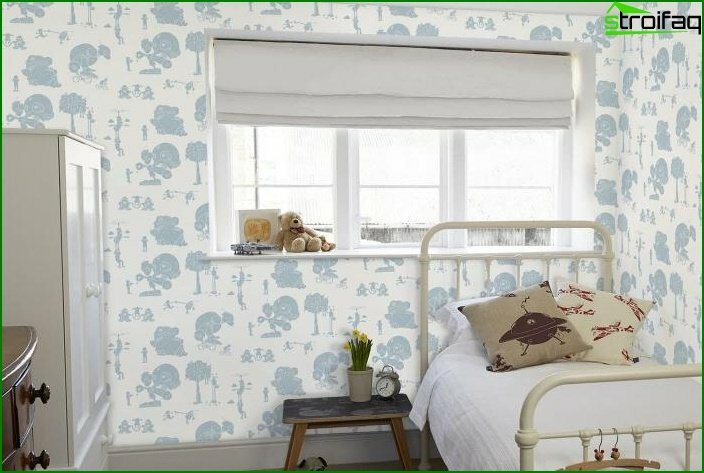 In this case, it is important to choose the wallpaper design that is ideally suited for your room (for more details about the drawings on the wallpaper we'll explain below). 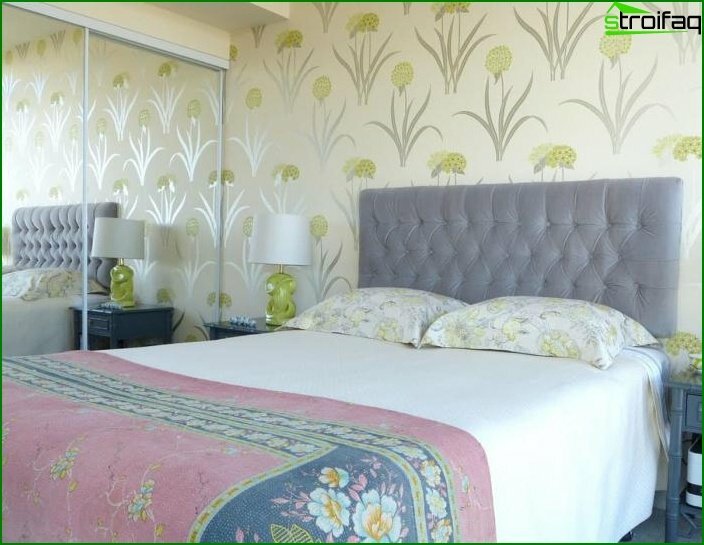 Typically, the wallpaper in this case is decorated with an accent wall. She can be at the head of the bed, but not necessarily. 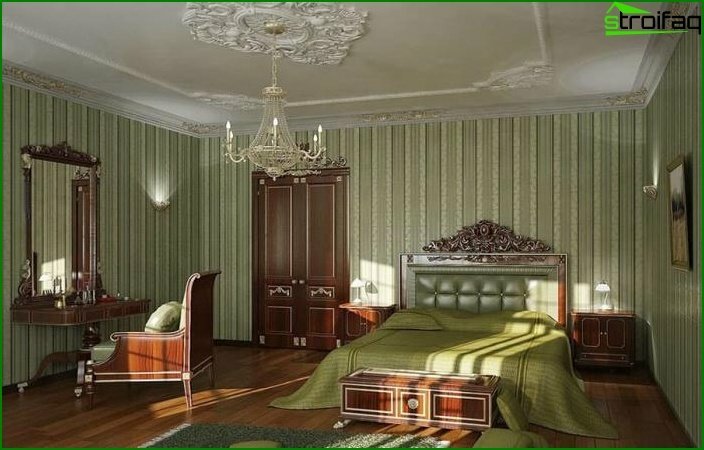 The most popular option in 2017, the design of bedrooms - the use of two types of wallpaper. 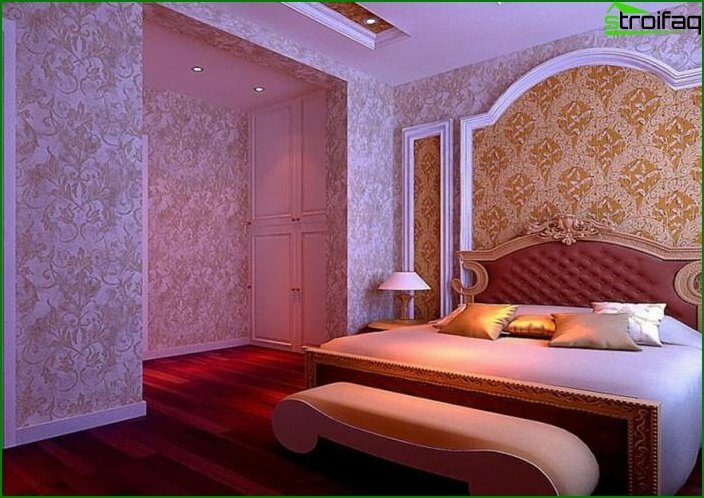 The main task of using two types of wallpaper in the bedroom is to visually zonate the space of the room and make it multilayered. 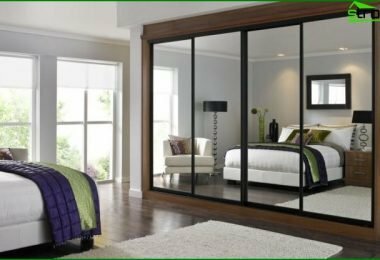 What part of the bedroom would you like to highlight and why? 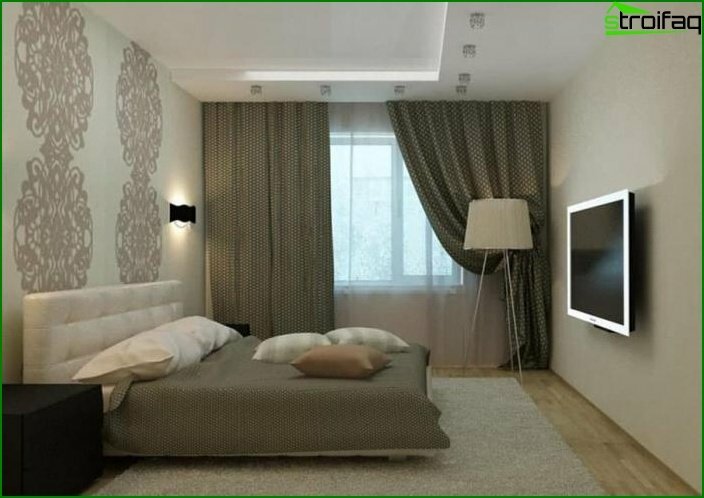 Should the walls with different wallpaper contrast or smoothly flow into each other? 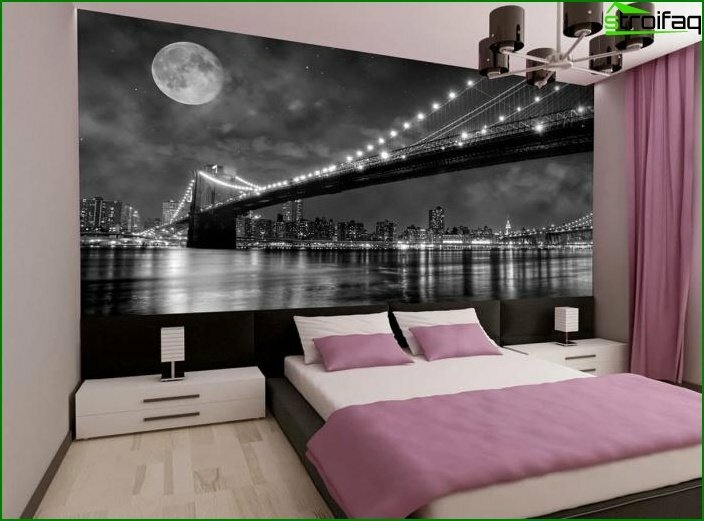 Will your bedroom walls be decorated with something else or not? 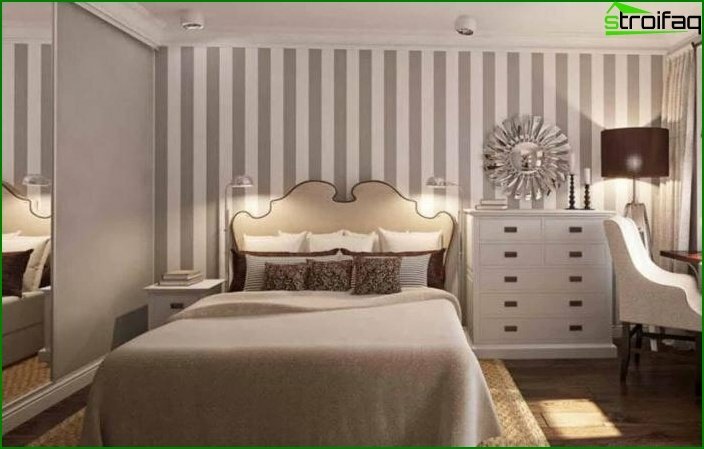 To determine the answers to these questions, our selection of 8 most interesting combinations of two types of wallpaper in the bedroom will help you. 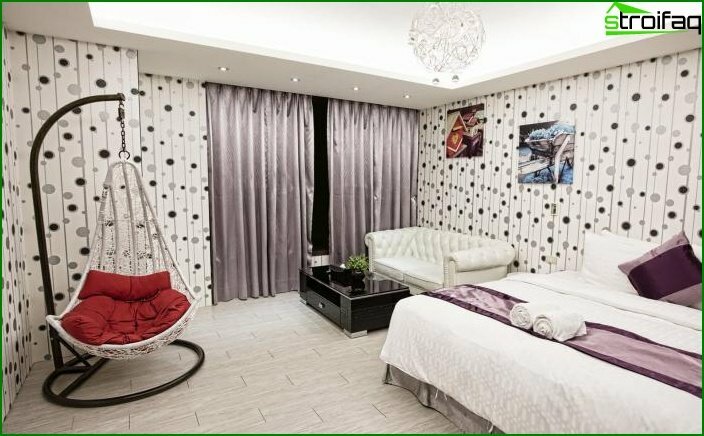 Very often, manufacturers of modern wallpapers specifically produce collections with perfectly matched texture or color wallpaper. Combine the contrasting colors you need very carefully! 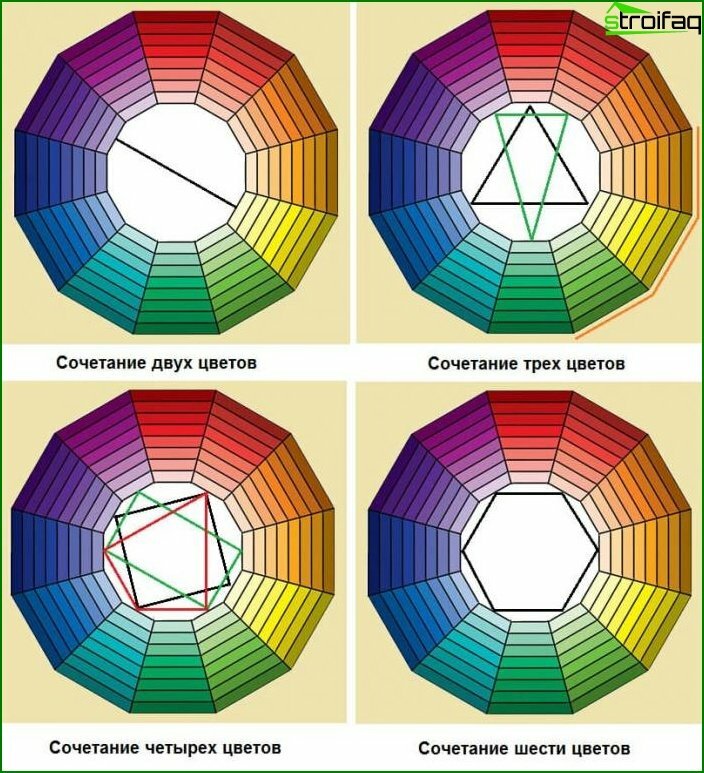 About how to properly combine shades in the interior (including 3 colors), we told in detail on the first page. 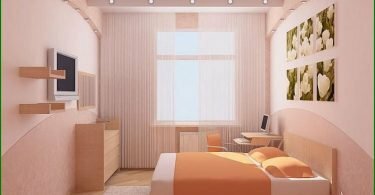 But more often in the interior of the bedroom different shades of the same color are used, smoothly changing into each other. Another option - to combine the wallpaper, in which the base color is the same color. 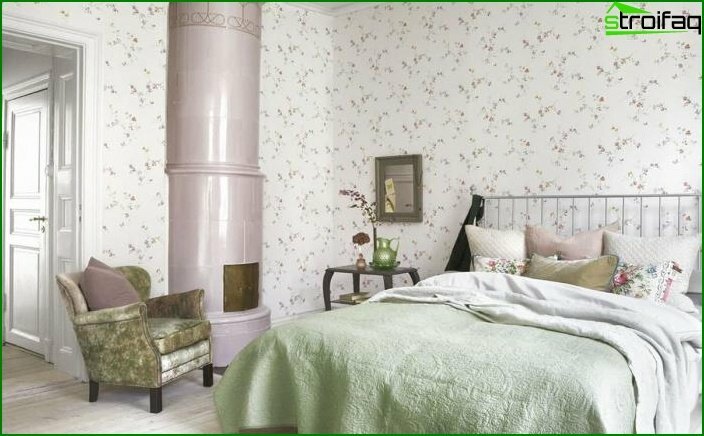 When combining in the interior of the bedroom three types of wallpaper, at least one of them must be neutral / monophonic. A universal color for tricolor combining is white. 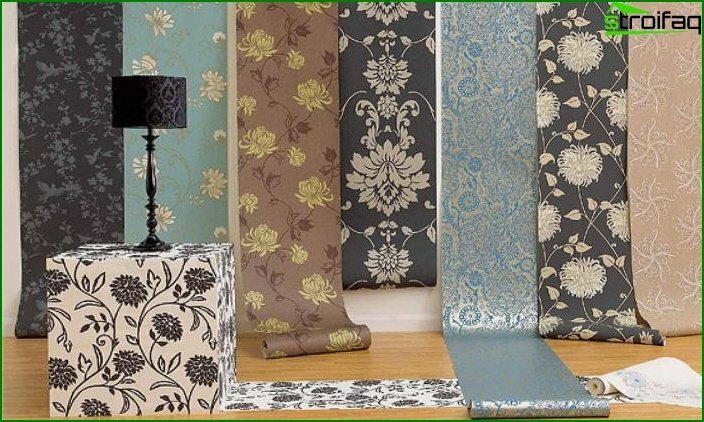 Wallpaper - one of the main materials for decorating the walls. 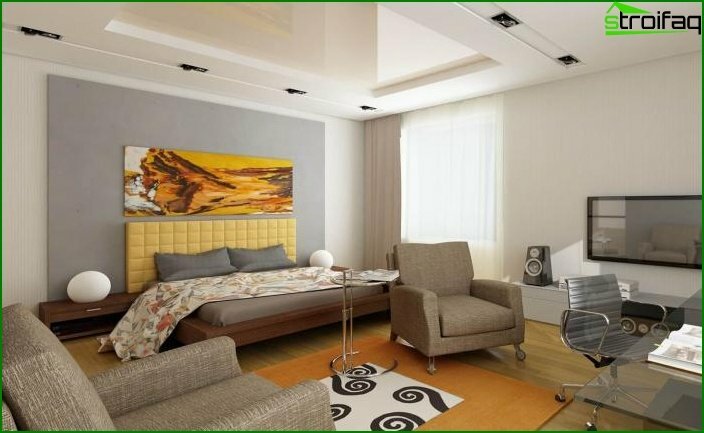 With their help, you can achieve various visual effects, sometimes even more interesting than using conventional paint. 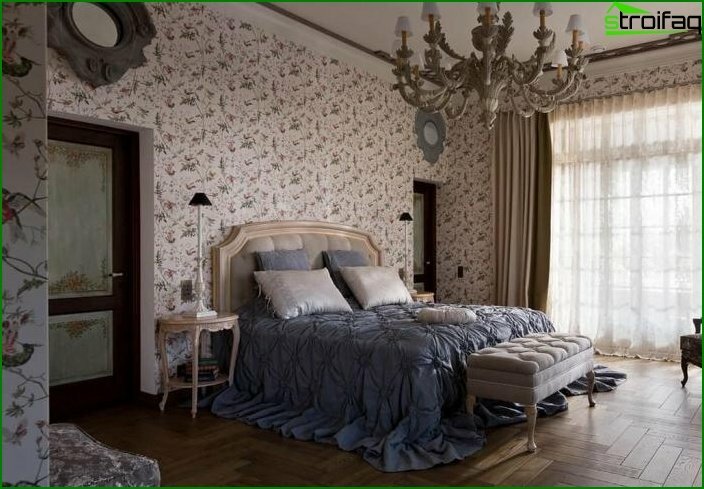 Let's see what kind of wallpaper there are and how they can be used in the interior of the bedroom. 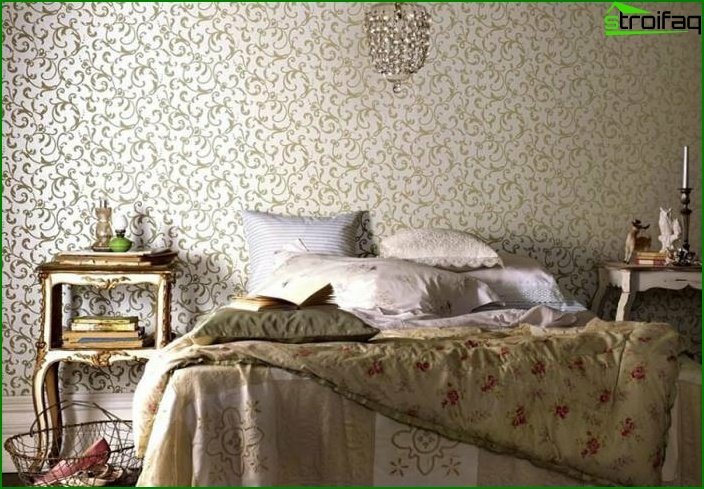 The wallpaper without drawings and contrasting sputtering is considered to be monophonic (even if there are some minor color variations, for example due to the texture of the canvas). 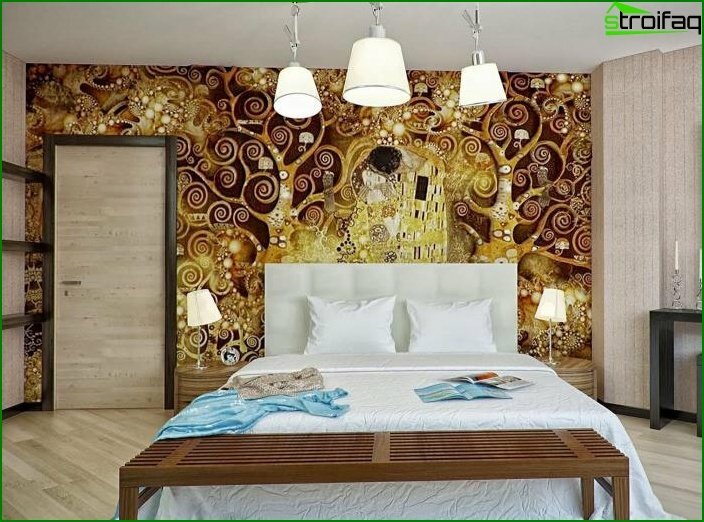 Solid wallpaper is perfect for a bedroom withRich textile finishing and advantageously emphasize the unusual, catchy furniture. Otherwise, furniture, textiles and curtains will merge into one tasteless tart spot. Do not like monotony? 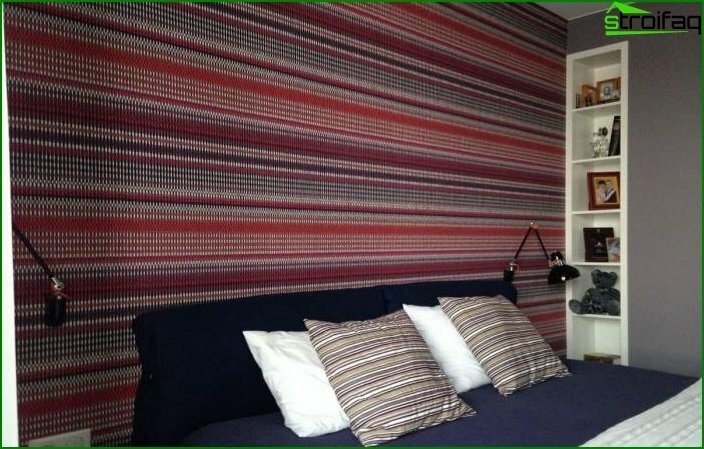 Then pay attention to the wallpaper with a small pattern. 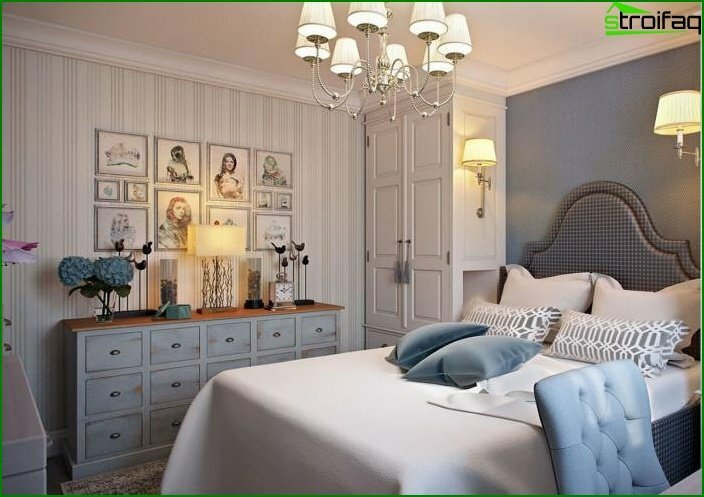 A small picture on the wallpaper gives the main colorInteresting additional shades, as if enveloping a background. 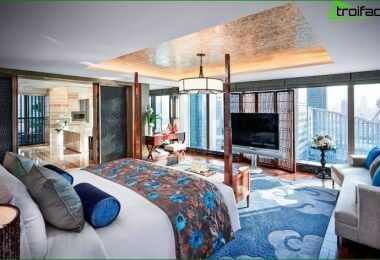 Patterns can be both drawn, and more textured - for example, in the form of spraying from foamed acrylic or woven into the wallpaper of the finest gold threads. 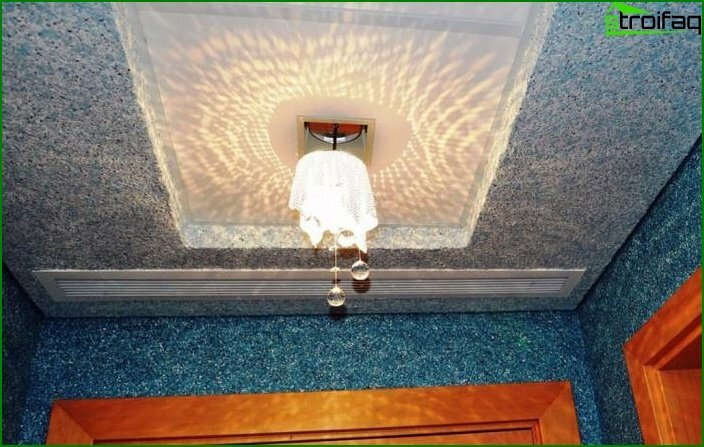 Light pattern in cold colors will help youVisually make the room more spacious and light. 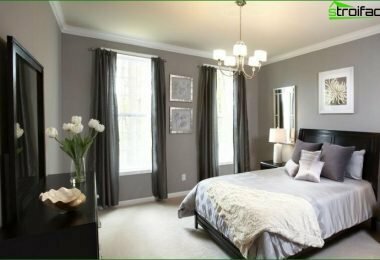 And vice versa - ornaments of dark tones of warm shades will draw attention to the walls more because of what the room may seem less. 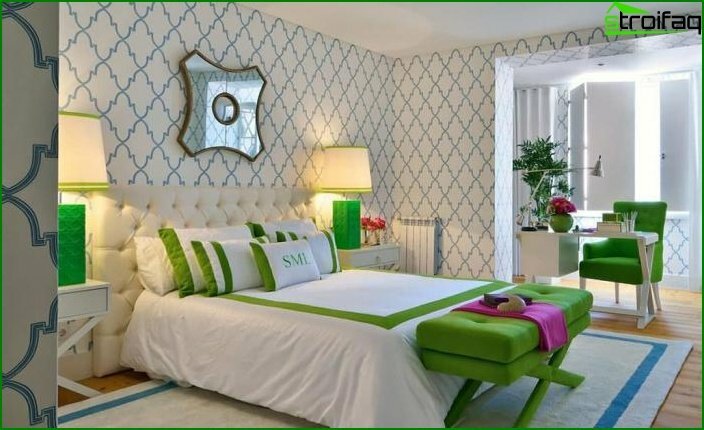 But the picture on the wallpaper does not have to be shallow! 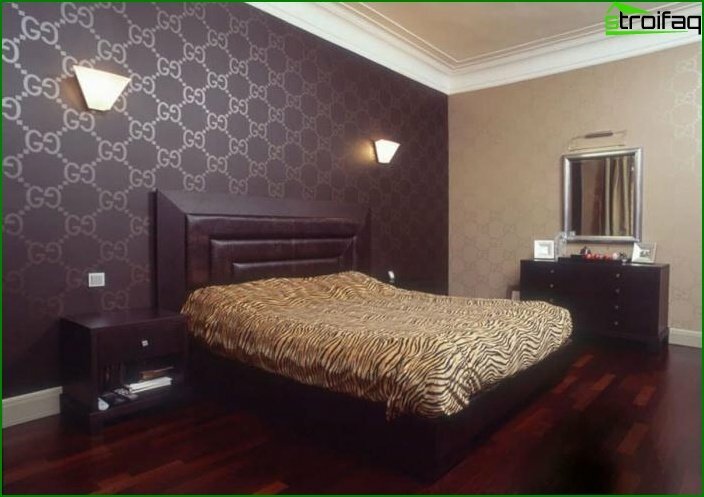 The wallpaper with a large pattern is very dynamic, conspicuous. They will look good in large spacious bedrooms. And remember the oil painting. In a literal sense. Near this incomprehensible chaotic brushstrokes, but it is worth moving away from the picture for at least a couple of meters, as they gather in a single plot with quite distinct outlines. The same principle and in the perception of large prints - all their beauty can be estimated only from a distance. By simple calculations, you can calculate that 2 meters from each wall (if you are in the center of the room) is a minimum of 4 x 4 meters, that is, as many as 16 squares. 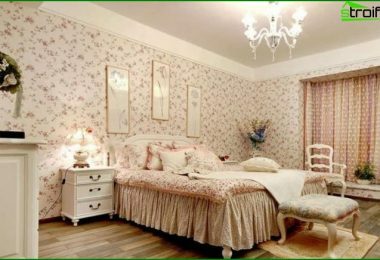 If your bedroom is more modest in size, then wallpaper with a large pattern is better to use to design one, the farthest wall. 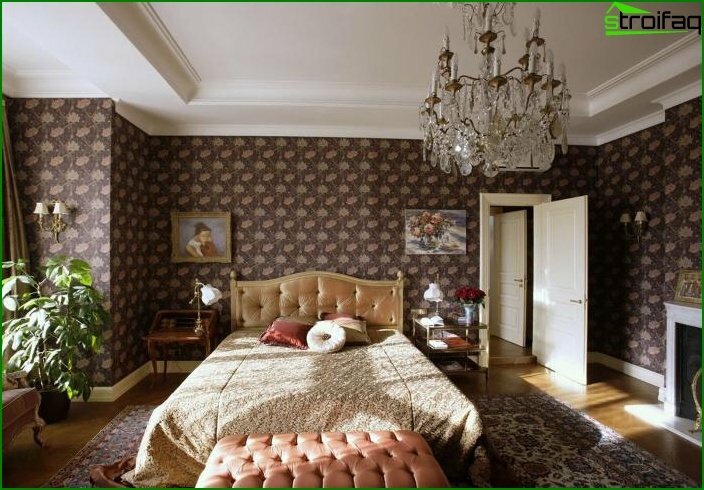 But what kind of print on the wallpaper to choose - depends on the style of the bedroom as a whole. 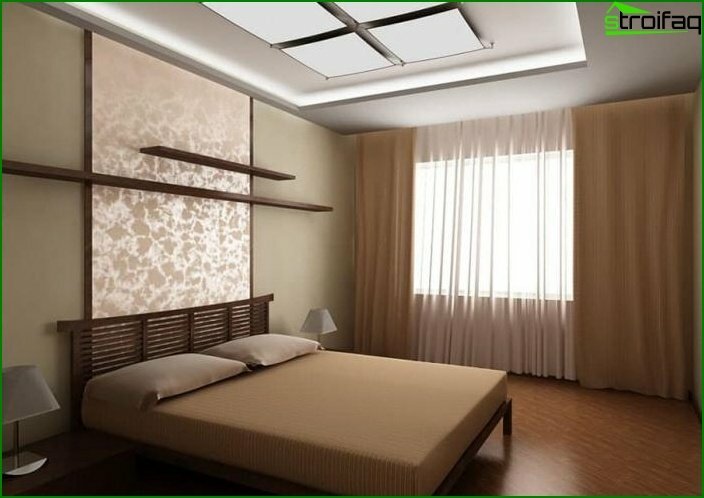 A large elongated pattern visually will make your ceilings higher. 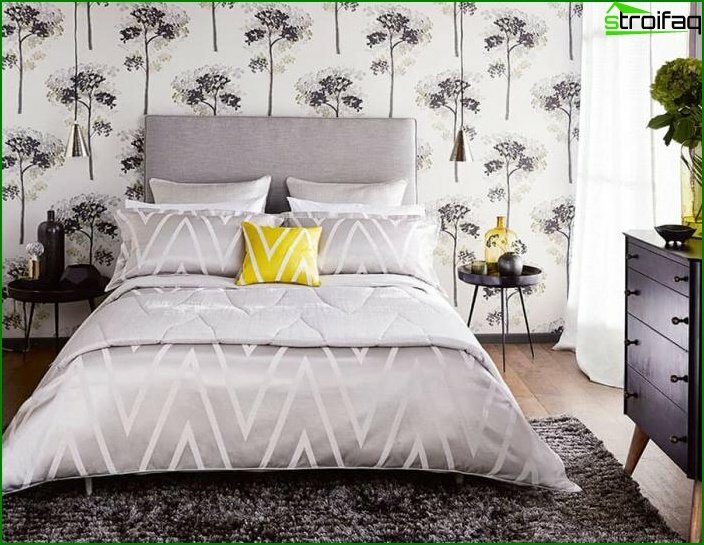 The geometric print on the wallpaper creates a feeling of uninterrupted space, which is very cool in the interior of the bedroom. 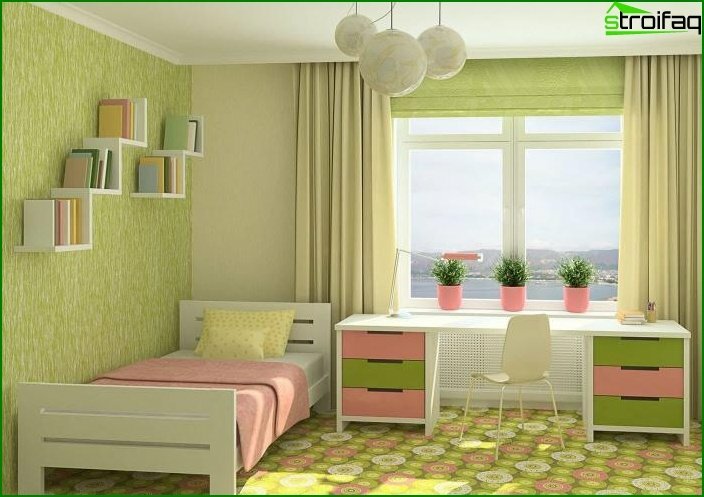 The main thing is to choose the size of the drawing - small for a small room and large for a large room. Strips on the wallpaper, perhaps, the most versatile assistant in creating visual effects in the interior. 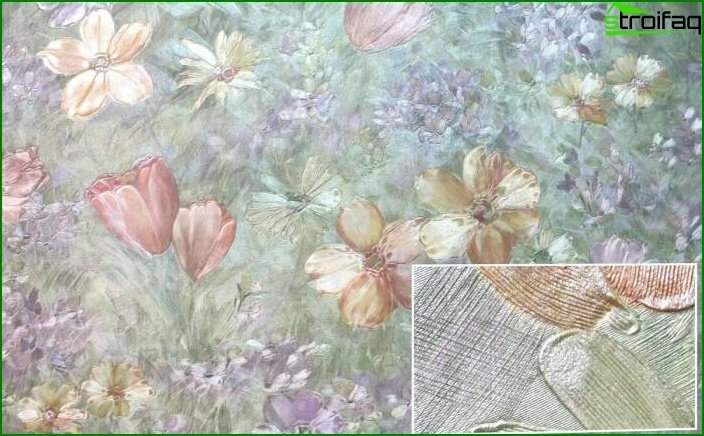 First, the strips can be clear andContrasting shades, and can be smoothly flowing into each other a sequence of transitions from dark shades to light ones, which looks more softly, but with all visual effects preserved. Secondly, the bands are of different directions. 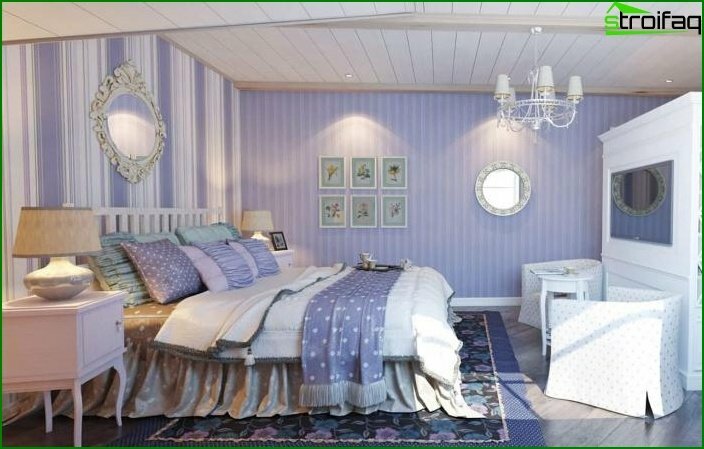 They will help visually raise the ceiling and make the room already. On the contrary will make the space of your bedroom below. 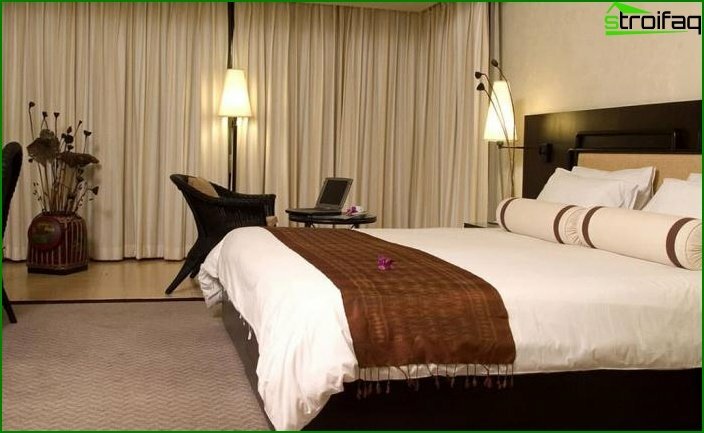 Set the perception of the room orientation, make it dynamic and impulsive. Of course, one of the main trends in 2017 is the use of a variety of textures - a stone of a tree, a brickwork, glass. 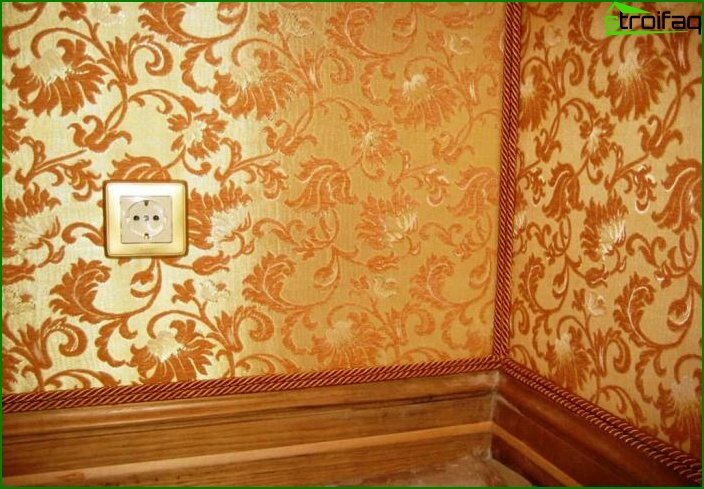 Perhaps these wallpapers and looked good and fashionable about 20 years ago, but now it is an absolute remnant of the past. 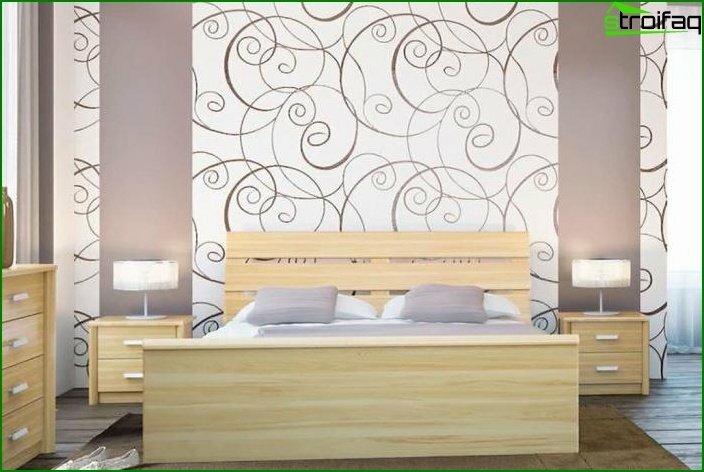 If you want to decorate your bedroom with textures, use natural materials or at least their analogues. 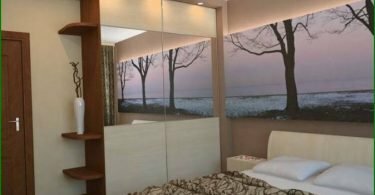 A stunning solution for the bedroom interior is the use of photo wallpapers. 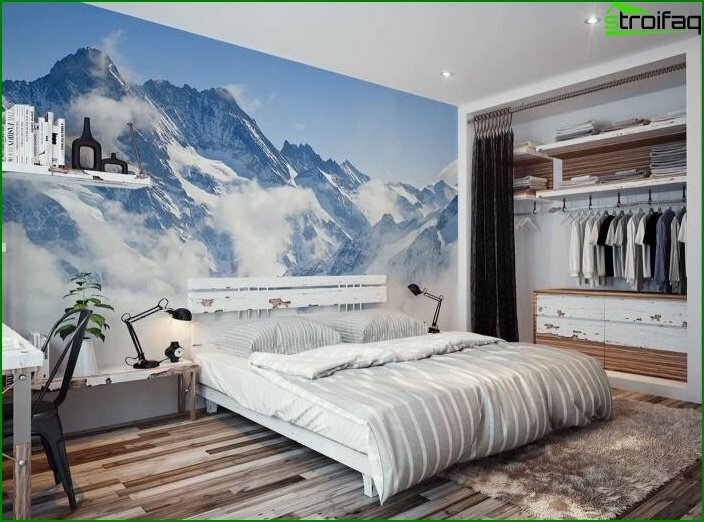 The wall with photo wallpapers is guaranteed to become accentuated! 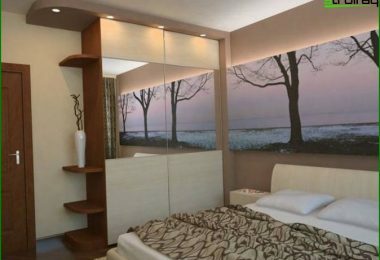 Due to the perspective of the photos, a feeling of additional space is created (like with a mirror, only more interesting). Modern technology allows you to produce a canvas of any size with any image. 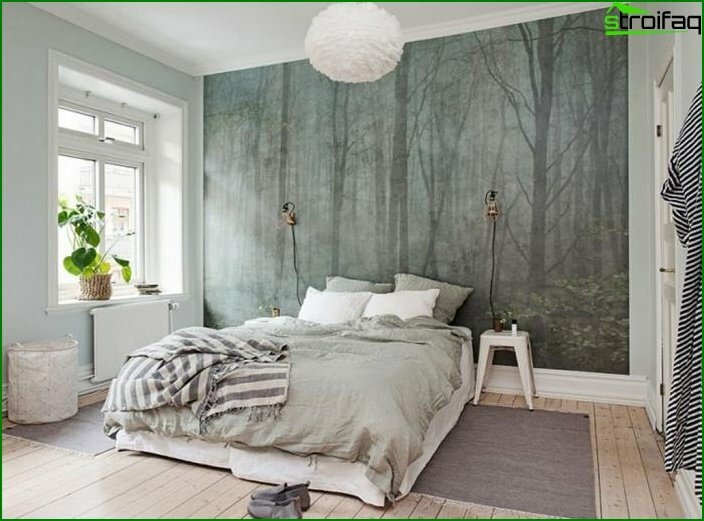 LifeFac: For wall-to-wall paper for you tooExpensive pleasure, you can order a canvas in height equal to the height of your window. Place them on one level - and voila! In your room, another window appeared! In addition to photos with perspective (cities or landscapes) in 2017 became megapopular 3D wallpapers. 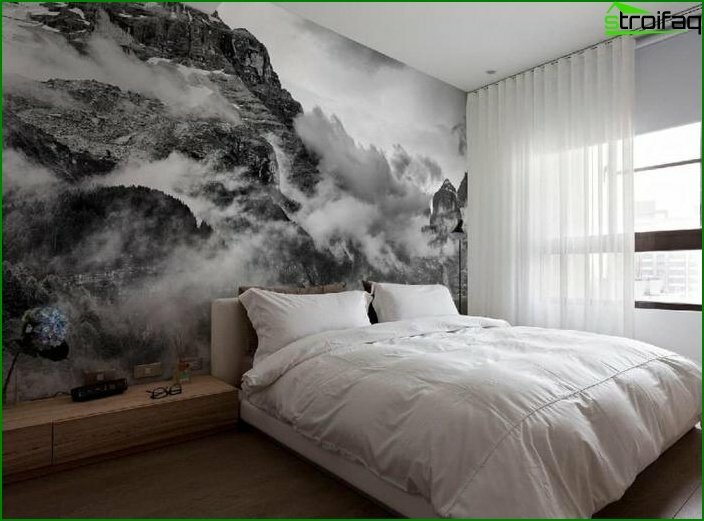 From conventional photo wallpapers, they differ images in macro mode with the effect of three-dimensional space. 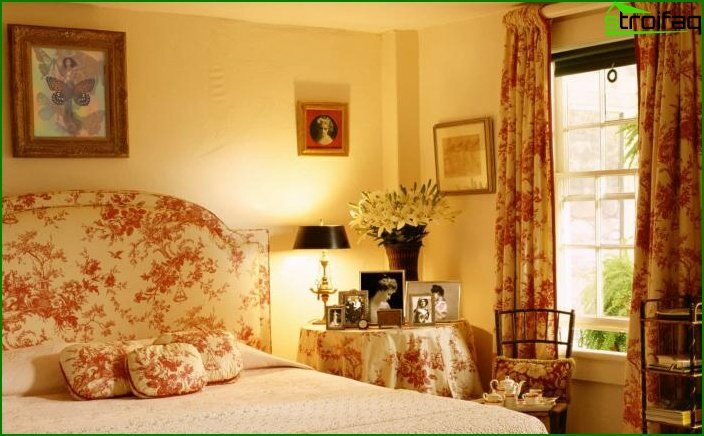 Look how amazing they look in the interior of the bedroom! 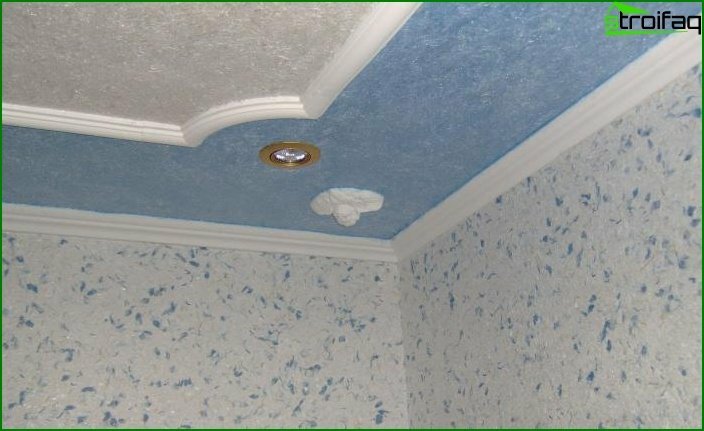 Well, in the end, we'll tell you what materials make the wallpaper. 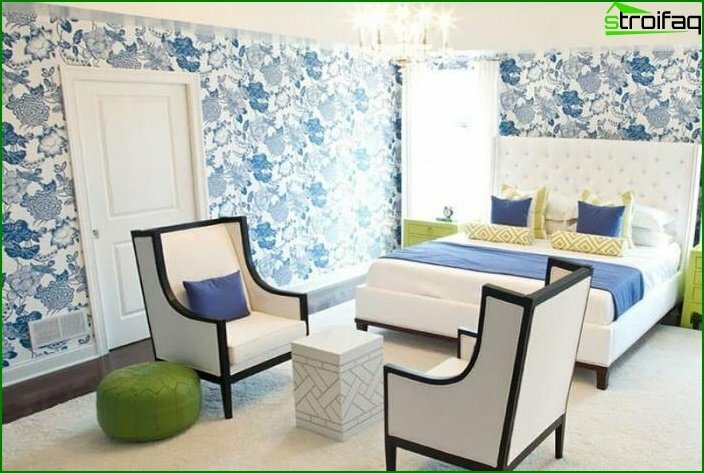 One of the most popular design options for walls is paper wallpaper. 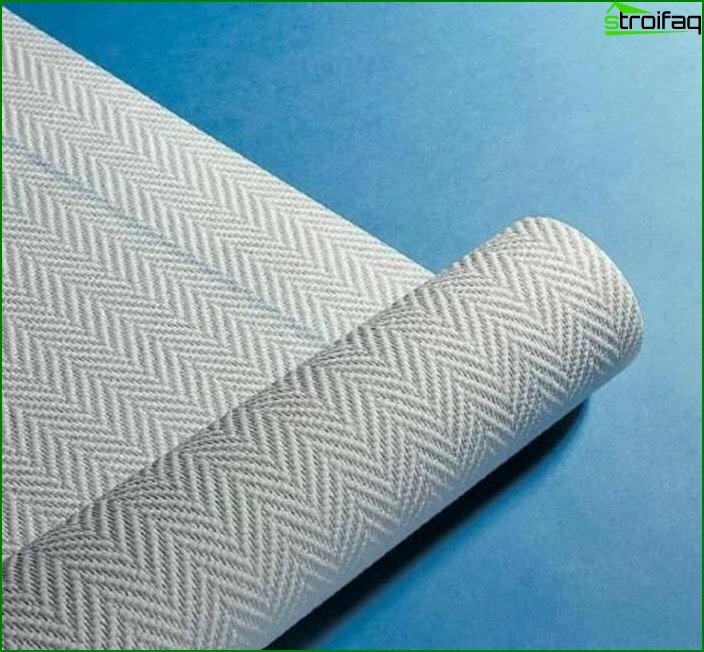 Wallpaper with a single-layered cloth is called "simplex", and with a two-layer - "duplex". They are made of long fibers of cellulose with the addition of special adhesives. A compromise between paper and fleece wallpaper. One of the strongest types of wallpaper. Especially popular with lovers of pets. 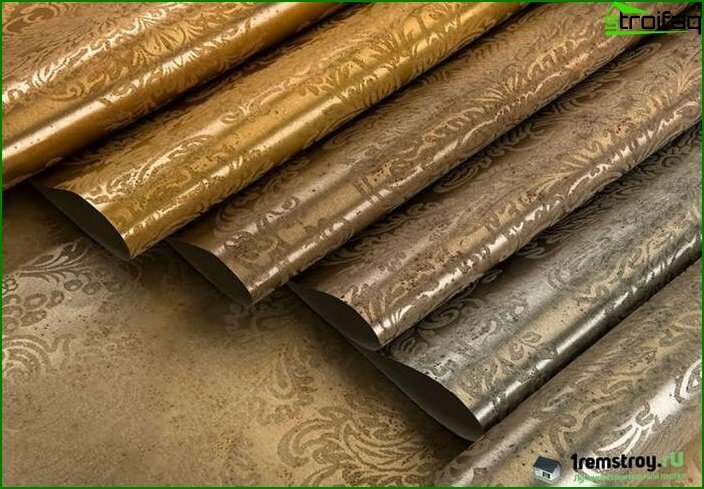 Relate to the price category "above average"
The most durable wallpaper - wallpaper from fiberglass. 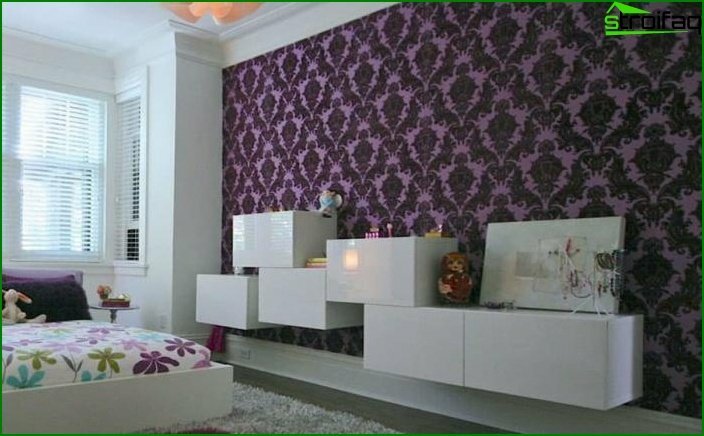 On such wallpaper, there will certainly not be any traces of the furniture standing next to them (for example, on wallpaper with acrylic coating). 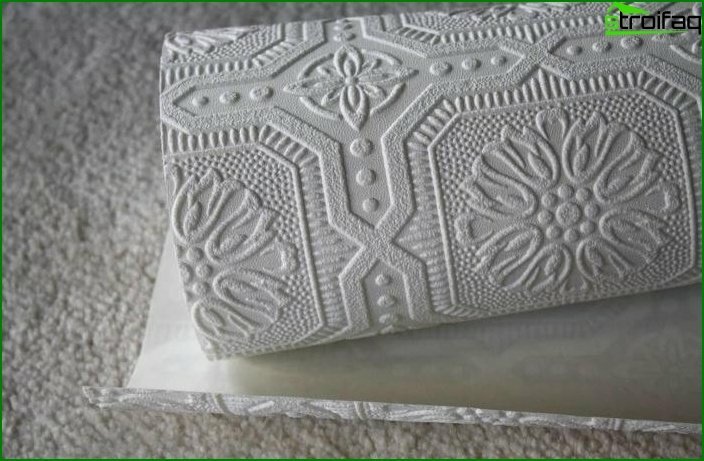 The fabric for decorating the walls is also used for a long time, like paper. 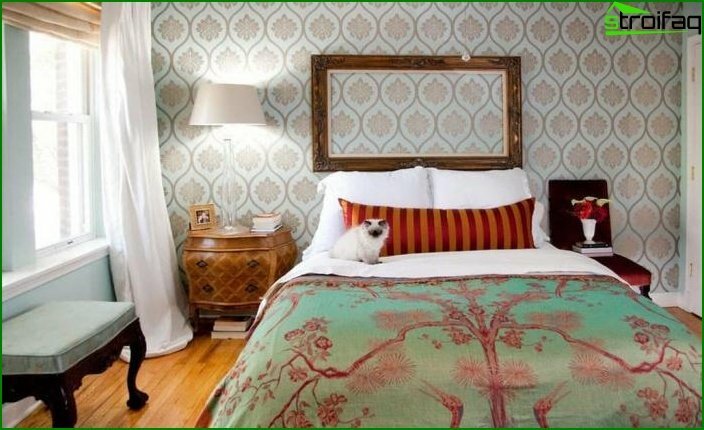 But textile wallpaper has always been a sign of wealth and wealth of the house, emphasizing its status, in contrast to paper. 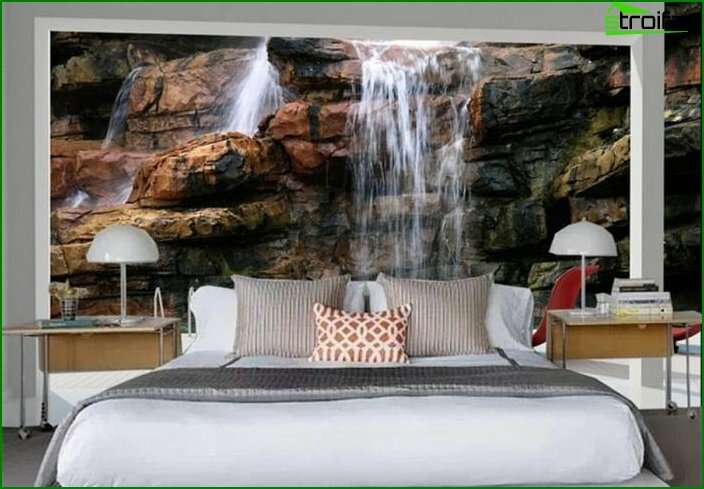 What will look in the bedroom in the style of high-tech or futurism steeper than a metallized wallpaper? Do you want to feel like a true artist? Then use liquid wallpaper! The grainy texture of the quartz wallpaper becameWorthy of attention novelty in the market of interior design. 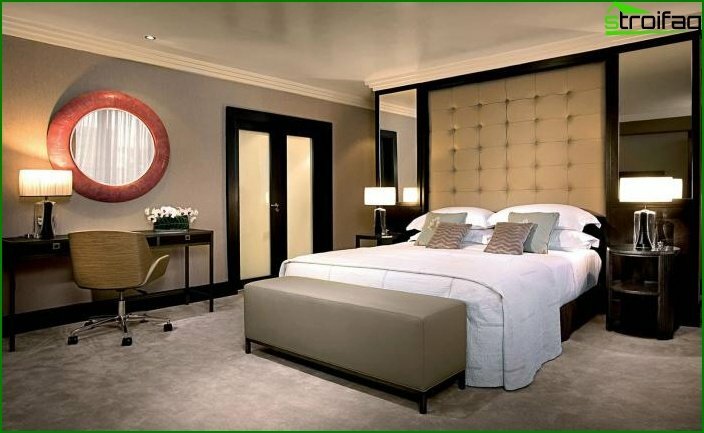 As a basis for these wallpapers, non-woven or paper, on which the crumb is applied: quartz sand, mica, granite. 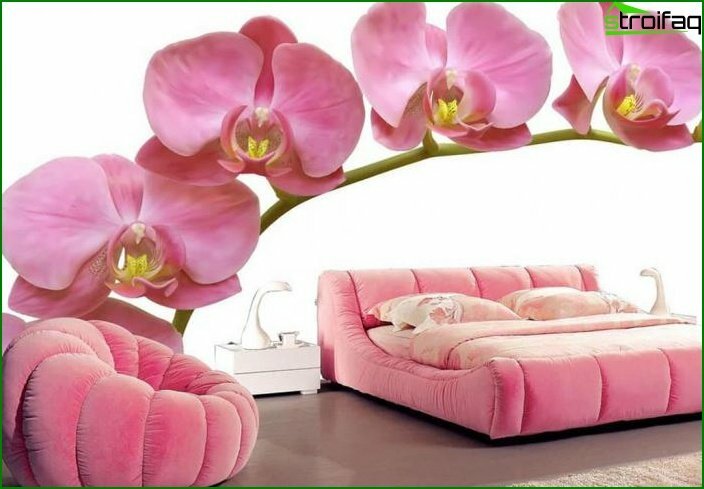 The trend of recent years is the eco-style inInterior decoration. 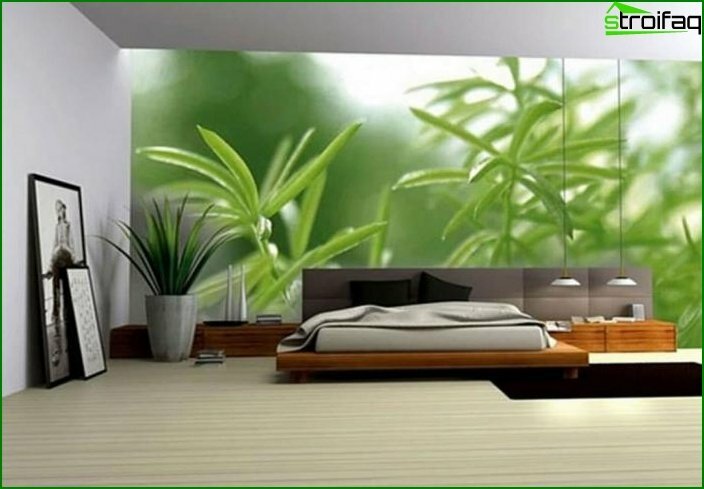 And if you are his follower - you can not do without wallpaper from eco-materials. 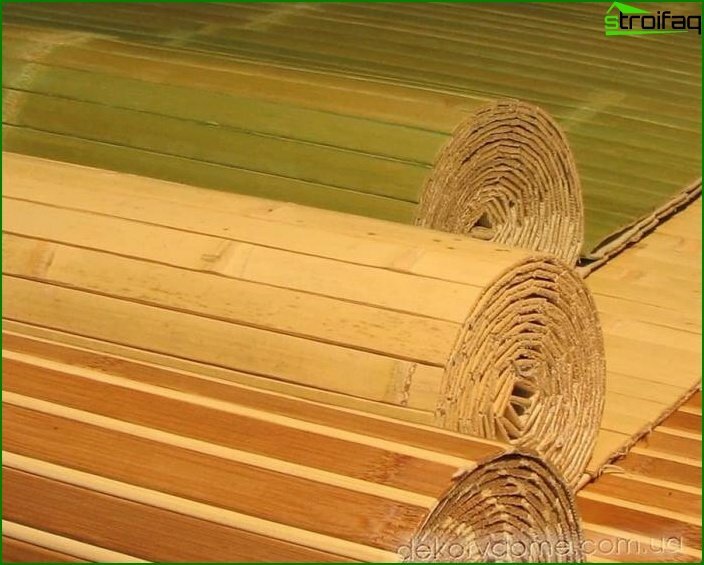 The most popular of them are bamboo, but there are other options.